INVENTORY, EQUIPMENT & FIXTURES!! ALL GOES ABSOLUTE!! 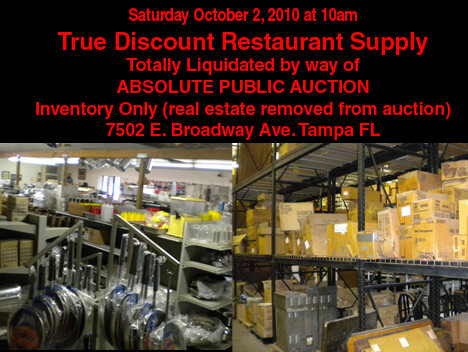 True Discount Restaurant Supply, a Tampa based restaurant supply warehouse for over 30 years has closed due to the owner’s health---- all of the inventory, and equipment---a 7245 SF building on a 150’ X 86’ lot will be sold by way of ABSOLUTE auction! Very centrally located at 7502 E. Broadway Ave in East Tampa, minutes from I-4, I-75 and the Selmon Expressway, this warehouse is a perfect location for servicing Brandon, Tampa, Temple Terrace and South Hillsborough County! Additionally, all inventory---restaurant small wares, equipment and fixtures---thousands of items will be sold ABSOLUTE!